The Bloodhound is a classic drink from the 1930s, with a storied history. It is also one of my favorite classic drinks, though it suffers from the unfortunate pathology that it can only be made using fresh berries, and hence, must be enjoyed in the summer time. The original version of the drink is made with strawberries, but I prefer a canonical variation known as the Halsdon, which is made with raspberries. And yet, the Bloodhound is not the drink we will be discussing today. Last Saturday, amidst all the hullabaloo of Fernet Branca and Pineapple, I had intended to make a Bloodhound, because I had some raspberries on hand. But as I was preparing to make the drink, I discovered that James’ dry vermouth has gone off, even though he stores it properly. Faced with soured dry vermouth, I decided to improvise, and substituted (in the loosest sense of the word) orgeat syrup for dry vermouth, and muddled the raspberries in the orgeat. The result did not have much in common with the original, but that did not stop it from being highly delicious. 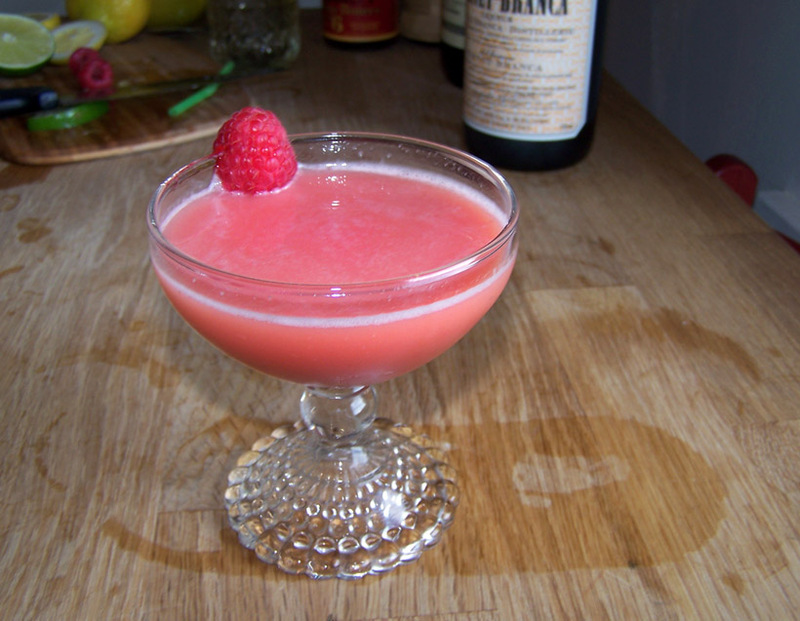 Muddle the raspberries in the orgeat, and then add the gin and vermouth and shake over ice. Double-strain into a coupe glass and garnish with a fresh raspberry. Admittedly, this drink tended a little more to the candy side of mixology, but sometimes, that is what a man needs. The name “Shiberry Inu” is intended as a play on the name “Bloodhound”. Runners up for this drink’s name were “Raspberry Shar Pei” and “Red Rover”, all trying to capitalize on the dogness/redness ideas. Categories: original creations | Tags: bloodhound, booze, cocktail, cocktails, drinking, drinks, dry vermouth, gin, hayman's, mixed drinks, mixology, old tom gin, raspberry, sweet vermouth, vermouth | Permalink. Looks so sweet I’m making one now!